You have more options than you may realize for continuing your education after high school. It’s called postsecondary education. Earn a two- or four-year degree at a college. Enroll in a certificate program at a community college. Enter an apprenticeship program. Apprenticeships are formal combinations of classroom and on-the-job training. Enter an occupation-specific training program. These are sometimes called trade schools or vocational schools. Enroll in an inclusive college campus program. 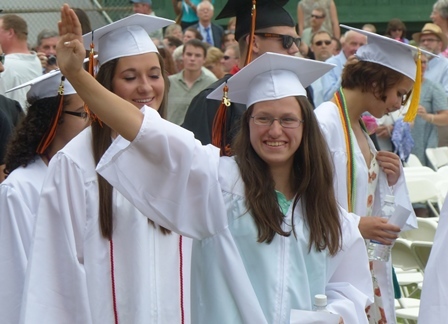 One example is Think College, a college option for people with intellectual disabilities. Start or continue training in a career or technical education program. Join a branch of the military: Air Force, Army, Coast Guard, Marine Corps, and Navy. Apply to Job Corps. Job Corp is a no-cost career technical training and education program for low income young people ages 16 through 24. Take an online course in a field that interests you. Accredited Schools Online is a website specifically about online postsecondary programs. Try a gap year program. Work and take adult or continuing education classes. Enroll in a one-year program to work on specific skills. Enter a volunteer program where you travel and work for a year in the US or abroad. …and more. You have options! Take a look at the highest-wage occupations within different levels of education. You may be surprised. From the US Department of Labor, January 2019. 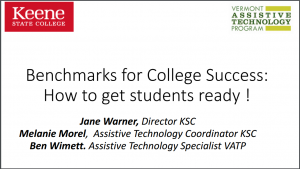 Benchmarks for College Success (PDF, 28 slides, 2016) is a Powerpoint presentation with more details on each of these benchmarks, especially assistive technology. “An Open Letter to Parents of Students With Disabilities About to Enter College” was written a few years ago by Jane Jarrow from the University of Buffalo Disability Services Office. “Very few children with disabilities can succeed at the college level. On the other hand, students with disabilities survive and thrive on college campuses across the country.” The letter is full of suggestions to help parents and students make the necessary transition from child to college student. The ADA, Section 504 & Postsecondary Education handout is one of PACER’s most downloaded and widely distributed documents (PDF, 3 pages, 2015). Going to College is a website developed by Virginia Commonwealth University with information about living college life with a disability. It’s designed for high school students and has video clips, activities, and resources that to help you get a head start. Winning in College: A Guide for Students with Disabilities is an online guide that covers topics such as rights of students with disabilities, required documentation, scholarships, and choosing the right school. It also has good sections about online courses, resources by type of disability, and suggestions for mobile apps and desktop software for assistive technology. A list of questions to ask to make sure a college can meet your needs, from Fastweb, a scholarship resource site. College Navigator is a quick way to compare information about different colleges, from the National Center for Education Statistics. Easy to use and interesting! College Resources for Students with Disabilities, from bestcolleges.com, explains your legal rights and campus resources that can provide you with assistive services and tools. The webpage also lists a number of other websites, apps, and software resources to aid students with specific types of disabilities. Comprehensive college search resource list, Getting There (PDF, 8 pages, 2013) from the American Association of People with Disabilities (AAPD), covering a multitude of topics. Some of the links no longer work, but there is still lots and lots of good stuff. “Disability Service” is a 26:58-minute video from Higher Education Today. Jonathan M. Young, Chairman, National Council on Disability, and Dr. Dorling Joseph, Disability Coordinator, University of Maryland Eastern Shore, discuss various aspects of disability services on college campuses. Planning Ahead: Financial Aid for Students with Disabilities (PDF, 49 pages, 2014) is a resource paper for students, parents, and others who help students with disabilities to get financial help for postsecondary education. Includes an introduction to financial aid, as well as lists of scholarships by field and some designated for students with specific disabilities. The Keene State College Links program is a six-week summer residential pre-college program for first-time college students. The purpose is to expose you to the academic and social expectations of college in a supportive learning community. The Heath Resource Center at George Washington University publishes a listing of summer programs for students with disabilities who are seeking ways to prepare for college and enhance college performance: Summer Pre-College Programs for Students with Disabilities (PDF, 16 pages, 2014). Heath has not updated their guide for a few years, however, the general program information should still be useful. Apprenticeships bridge the gap between school and the world of work. An apprenticeship is a way to learn a valued trade through structured on-the-job training, and get paid while you do so. FAQ on apprenticeships in NH from the Department of Education. New Hampshire apprenticeship information from NH Employment Security. A big list of occupations that have apprenticeships, with links to more information about each one. ApprenticeshipUSA is a national apprenticeship website from the US Department of Labor. It’s easy to use, with information about apprenticeships in general, a map to search for opportunities, and a big FAQ. Giant resource list for apprenticeships, including international options. It was last updated in 2010 so some links no longer work. However it still offers a lot. NCWD/Youth developed two apprenticeship training modules and a strategic planning exercise. The modules can be used independently to learn about apprenticeship, or a facilitator can use the modules to train groups. One is an overview and history of apprenticeship in the U.S., including how apprenticeship is structured, regulated, and implemented at the national, state, and local levels. The second provides specific information about serving youth with disabilities and connecting them to apprenticeship opportunities. Just click through the powerpoints if you want the core information. Youth Apprenticeship in America Today (PDF, 32 pages, 2017) gives a good overview of the history and current state of apprenticeships in America, along with examples of innovative state approaches. Trade or vocational schools are also called career schools, occupation-specific training programs, or job training programs. While a traditional college may require you take classes in a variety of subjects, trade schools focus on training you for a specific skilled career. There are a lot more options than you think! The American Council for Professional Education and Training (ACPET) has a Technical Training & Career School Directory of competency-based education and training programs in northern New England (PDF, 40 pages). There are brief descriptions of the programs as well as general career school tips and information. In 2014, there were 14 accredited trade schools in New Hampshire. Real Work Matters lists vocational schools all over the country. Accommodations are tools and methods that give you more options for how you learn something, for example, extra time on tests, audio or e-books, or a notetaker. Accommodations (NOT modifications) can be critical to success at the postsecondary level. Your IEP or 504 Plan does not follow you to college. It may provide useful background information but has no legal standing once you graduate from high school. At the college level you can get accommodations to help you do your work, and then you must meet the same course completion standards as any other student. To get accommodations you must provide documentation of your disability to the college disability services office. Documentation and the nature of your disability is confidential information and will not be shared with your professors or other college staff. The disability services office will determine if you are eligible for accommodations, then work with you to plan your accommodations. You will be the one to deliver the requests to your professors. The college must provide the agreed accommodations. However, you the student are the one to make the request. It’s not done for you as it was in high school. Getting Accommodations at College: Tools for School when you have a mental health disability. Attractive, user-friendly tipsheet from Transitions RTC in Massachusetts (PDF, 2 pages, 2011). You can change your mind! You can always change your mind. You can even fail. No experience is wasted. In fact, today’s high school graduate will probably have five or more “careers” in the coming decades. A successful work life requires collaboration, communication, and adaptability. These abilities are as important as job-specific skills, and you carry them with you as you change jobs. Your creative and intellectual abilities will only expand as you grow older and your world enlarges. In other words, it gets better. If you aren’t sure what your strengths are and what you might be good at, ask a trusted mentor or teacher for an honest evaluation of your people skills, not just your academic skills. Go with your strengths.